Online marketing tracking and analytics tools are constantly evolving to provide more information about consumer behavior, site traffic and activity. 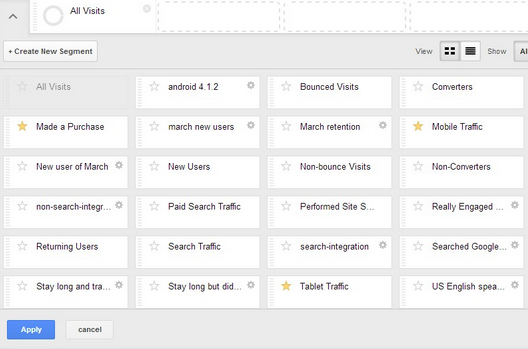 Google has recently announced a reimagining of their Advanced Segments feature in Analytics. This latest update presents changes in the way you can create segments, wrapped in a new user interface. Perhaps the most important of all the changes is the addition of creating advanced segments based on users. With advanced segments based on visits, you can track acquisition methods and conversions – on-site engagement and goal completions. These are useful for analyzing your campaigns, but they do not offer any insight to individual behavior. The user segment update allows you to track the long-term value of your users more accurately by looking at individual user behavior. When creating user segments, all visits of users who suit the specific conditions you’ve set will be included. This could be specific demographics, behaviors, or other conditions. You can still create visit segments based on advanced ‘conditions’ and ‘sequences’. It’s also possible to create advanced segments based on a combination of visits and users. Now, you can also create segments based on when they first visited your site. You can choose a specific date or set a period to group users based on their date of first visit. With this new feature, you can monitor the behavior of customers who started visiting your site at a specific time and determine their long-term value. Another advanced segment you can create is a sequence segment. This allows you to track information based on a user’s actions from the point he visits landing pages to the point he converts, whether it is on the same visit or a different one. The refreshed user interface may be less colorful than the previous one, but it compartmentalizes everything cleanly. At first glance, it looks as though Google has reduced the features of Analytics, but they have only arranged these in segment cards in order to make the creation of new advanced segments easier. The new UI also features new filter options, allowing you to view your segments in list or grid view. You can use the templates immediately or adjust the settings according to your specific tracking requirements. It’s also easy to combine the settings of two or more templates to give you a custom advanced segment template. TrueLogic Goes to the Movies!